I have suddenly found my new love in avocado. Yes, honestly! I am in love with avocado! Sadly, I had never given this gem of a fruit much attention in all these years and only now I realize what I have missed so far. But what had been done can’t be undone now; so be it. I am happy now that I have finally discovered this delicious fruit and the unlimited number of yummy recipes associated with it. There are so many salads with avocados and I had a hard time deciding on which one to make at the first attempt. 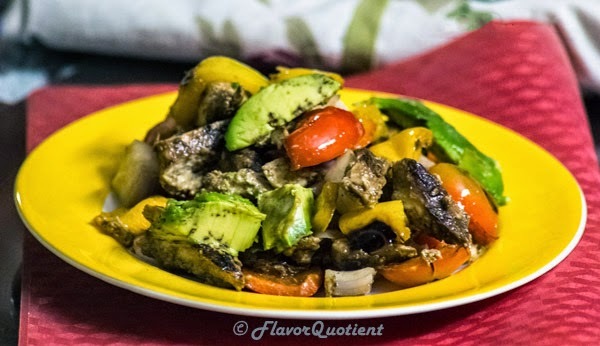 So I decided to take on the easiest and the most popular one – avocado and chicken salad – and then added my twist with the roasted bell peppers of three colors. This is a wholesome salad which can be ideally served on a Sunday brunch. 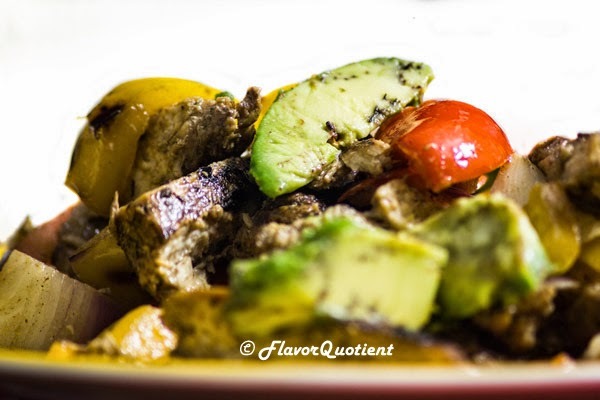 The combination of soft avocado and grilled chicken is simply wonderful, plus the charred bell peppers make it an ultimate delight. There may be thousands variations of this salad and you can pick and choose the one dressing that suits your taste buds most. I have kept my salad dressing simple with my favorite Dijon mustard and rice wine vinegar. You are at your complete freedom to experiment with the salad dressing you like. I hope you will also like it as much as I do! Enjoy! Marinate the chicken breast with balsamic vinegar and salt for 15 minutes or so. Cut the bell peppers into pieces big enough to grill easily. We will cut them into small once roasted. Preheat the grill to gas mark 4. Brush it with olive oil. Brush the chicken breast with olive oil and carefully place it on the grill. Sprinkle the bell peppers with some salt and place them on the hot grill too. Turn the chicken breast after around 4 minutes and roast the other side too till tender, approximately 3 to 4 minutes. Chicken breasts cook very quickly, so be careful not to overcook them as it will turn too hard to eat. Insert the tip of a pointed knife into the thickest part of the chicken. If there are no traces of pink, your chicken breast is done. Take it out and keep it to rest for 10 minutes. Resting is important as it will make the chicken juicier. Check on the bell peppers. Take them out if they have also become soft. Now cut the bell peppers into bite size pieces, around 1 inch square. Cut the chicken breast into small pieces too. Deseed the avocado and slice them into long pieces. Prepare the dressing by mixing all ingredients thoroughly in a bowl. Take a salad bowl. Assemble grilled chicken, roasted peppers and avocado. Pour the dressing on top and give a good mix. Adjust seasoning by adding salt and pepper if required. Serve warm immediately.